Great Senior Living – a platform which is dedicated to the well-being of the elderly, recently started a small project called “Gone But Not Forgotten”. 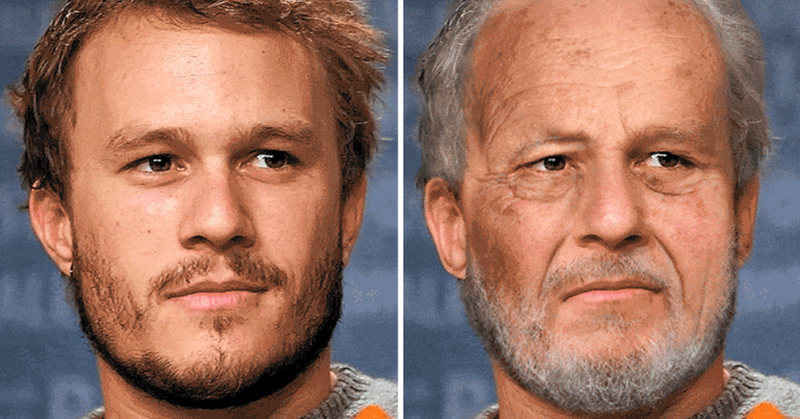 It is a tribute to famous people who were taken from us way before their time, in which a .gif image shows what they might have looked like as they got older. Real photos of the celebrities are digitally altered to show them aging, usually at ten-year intervals. The project covers a wide range of celebrities, from modern-day icons who died tragically young, to iconic political figures from centuries past. Beloved Hollywood actor Heath Ledger passed away at the tragically young age of 28, having not long finished shooting his performance in Christopher Nolan’s second Batman film The Dark Knight. Sadly, Heath never got to see his own performance on the big screen, but he did receive a posthumous Academy Award for his amazing performance. As one of the leaders of the civil rights movement, Malcom X was one of the world’s most prominent political figures before being assasinated in 1965. His brutal on-stage murder, at the age of just 39, made international headlines. Princess Diana was adored by the public for her compassionate nature, and the work she did for various causes including HIV/AIDS, landmines, and leprosy. A brilliant, kind young woman, she was taken from us way too soon in a tragic car accident in 1997, at the age of just 36. We can’t help but feel that she had so much more to give, had she lived a longer life. Amelia Earhart was a truly fasinating woman. She wrote herself into the history books by becoming the first female aviator to cross the Atlantic Ocean, but sadly disappeared while flying over the Pacific Ocean in 1937. Earhart was declared dead in absentia at age 41 in 1939, although more recent research suggests Earhart died as a castaway. Truly one of the most remarkable figures in American history, Abraham Lincoln was assassinated by John Wilkes Booth in 1865. He is remembered as a titan of politics, who achieved the momumental task of abolishing slavery in the United States. Great Senior Living’s .gif shows what he may have looked like, had he lived to the ripe old age of 94. What do you think of these images, folks? Interesting, creepy, or both? Let us know your thoughts in the comments.